Clearly cleverly calculated to appeal to the male 18-35 demo. So, there’s this kid’s show–more of a family show, really–and it’s really popular with adults. It’s one of the biggest fandoms out there right now, and one of the best shows on TV. So one day, this guy decided he would make a blog where he goes through every episode and analyzes it as a work of postmodern art. And he called it… TARDIS Eruditorum. And then I discovered it, and devoured it hungrily. When I was caught up, I said to myself, “Hey, I could do this.” I mean, probably not nearly as well–he’s a freakin’ Ph.D., all I’ve got is a measly B.A.–but I can certainly take a crack at it. And so today, on what happens to be the second anniversary of the premier of My Little Pony: Friendship Is Magic, I bring you My Little Po-Mo: Analysis Is Magic. Why not? 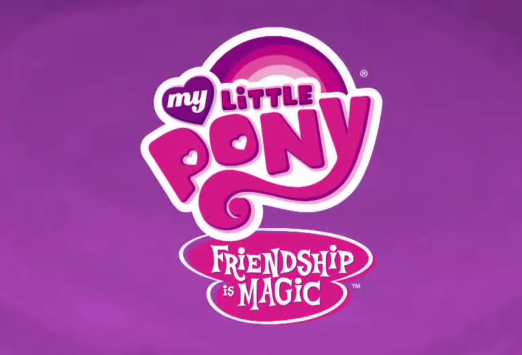 I love MLP:FIM. It’s got stellar production values, a great cast, sparkling art, engaging characters, and a fun story. But everyone knows that. You can’t toss an e-rock (or iRock, if you’re on a Mac) without hitting a dozen sites all about how great MLP:FIM is, plus four fanfictions and three fanart sites (at least one of them pornographic; this is the Internet, after all). What’s quite a bit harder to find is anything that goes deeper than the surface. What is MLP:FIM? What is it about? And don’t say “nothing.” Nothing’s about nothing. It’s impossible to create creative work that isn’t about at least three things: itself, its medium, and the world in which it was made. So at the very least, digging deeper into MLP will tell us more about MLP, animation, and America at the moment of transmission. Further, all exploration is to some extent self-exploration, and thus exploring MLP should tell us more about ourselves. But again, we could do that with any work. Why MLP? Ultimately, the only reasons to explore anything: Because it’s there. Because as near as I can tell, nobody else is doing it. And because it seems like it’ll be fun. Postmodernism is rooted in the idea that the way in which we perceive and understand reality is shaped by social constructs–systems of ideas that society collectively creates. Our constructs enable us to draw connections and find patterns in the world around us, but they also make it harder to see different patterns, like trying to hum one song while listening to another. Most of the time, we are unaware of the constructs that shape our reality, so postmodern works try to draw attention to the constructs in play, usually by subverting them. MLP does this all the time. For instance, one of the simplest types of social constructs is the binary. Simply put, a binary splits the world into two opposited: good/evil, male/female, light/dark. Binaries are good tools for making quick assessments, but they also blind you to a lot. For example, a black/white binary denies the existence of grays, forcing you to pick a more-or-less arbitrary dividing line being black and white. But, more importantly, it obscures the existence of color: not only is red neither black nor white, but if you draw a line from black to white, red is nowhere on it. That might seem like not such a big deal, but consider something like the gay/straight binary, which denies the existence of bisexuals (which is bad enough), but obscures the existence of other types of sexuality that are on a different spectrum entirely (asexuality, for instance). That can be a serious problem if you identify as one of those obscured groups, and have to convince people you exist when their picture of the world has no room for you. There’s a few binaries that MLP likes to subvert, and I’m sure we’ll find more as we continue, but the two most obvious are boy/girl and child/adult. Simply put, MLP is a show for little girls with a large audience of grown men. This is mindblowing if you’re wedded to those two binaries. Read pretty much any article about bronies in the mainstream press; they pretty much all hover somewhere on the border between astonishment and contempt. Another way to draw attention to the constructs in play in a work is by playing with genre: stretching genres, mashing them up together, pulling ideas from one context and putting them in another. MLP loves to do this, as we’ll see when we go episode by episode. It is a show that can do a typical sit-com plot (babysitter with no childcare experience bites off more than she can chew), then interrupt it with a horror movie about a monster attack–and then have the resolution to the horror plot solve the sit-com plot, too. The plan right now is to have one post dedicated to each story–so, for example, “Mare in the Moon” and “Elements of Harmony” get one post to share, while “The Ticket Master” gets one post of its own. These are not going to be summaries or reviews in the regular sense–they will be written with the assumption that everyone has already seen the episode in question–but rather critical essays that try to read the episode in terms of what it might tell us about MLP:FIM, animation, or the world. My goal is to make each essay about 2000 words (that is, about twice the length of this post), and have one up each Sunday. Given that there are already 49 stories in the first two seasons, and season 3 will be well over by the time I finish the first 49, this project should last us a good long time. See you this Sunday for eclipse myths, ancient evils, and magical girls! This sounds like a lot of fun! I've never seen the show, but I've heard good things. I love that the show not only has positive role models for girls, but that they are so awesome that they cross over all of those binaries. It's a really good show, one of the best on TV in my opinion; I highly recommend it. You can find the whole series up on YouTube, and the DVD set of the first season comes out in about a month. NB: Edited to correct the episode titles in the penultimate paragraph. NB: Edited again because 25 plus 24 is 49, not 51. There are not words for how happy I am that this blog exists. I made squeeing noises when I saw this comment. You have completely made my day, sir. Can I just say how weird it is to see the little pencil icon next to Froborr's name instead of Philip's?